Korean ginseng (Panax Ginseng) is considered an energizer, normalizer and stress reducer. The root must be at least six years old to be effective. The older the root, the better it is for improving your health. Also the price is directly related to the age of the root. The older the root, the more it costs per ounce. Wild roots are very rare and command a great price. This herb has a very positive effect in making the whole body healthy and can balance all the systems of the body overall. Korean ginseng has been used to lower cholesterol, reduce stress, decrease stress and boost energy, treat diabetes, treat depression and sharpen the mind and memory and is a hugely wonderful herbal remedy for people suffering from fatigue. This type of ginseng really shines as an immune booster, helping prevent ailments caused by viruses and bacteria and can be taken at the onset of the common cold to reduce it’s severity and duration. For many years, Korean ginseng has been used to boost fertility in men and increase sperm count by activation specific hormones in the body. It improves blood circulation in the body and helps one recover from illness more quickly. Korean ginseng is very popular adults as it is thought to prevent senility. It’s strengthening and energizing effect are also important to keep the body active well into old age. Korean ginseng contains contains Vitamins A, E, and B12, sulfur, calcium, iron, manganese, thiamin, riboflavin, tin, niacin, phosphorous, sodium, potassium and magnesium. Korean Ginseng also contains many saponins, called ginsenosides and panaxosides. Ginsenosides have been studied extensively and have numerous actions, including: stimulation of the immune system, balancing blood sugar, inhibiting tumor growth, stabilizing blood pressure, and stimulation of bone marrow production, detoxifying the liver, and many other tonic effects. Ginseng also contains many other active substances and nutritional components. The body’s glands, such as the adrenal glands secrete hormones such as adrenaline. Other glands secrete their own important hormones. Ginseng regulates all these glands and puts them in better working order. They in turn control the body’s organs, helping them to stay balanced and work properly. Korean ginseng should not be taken if pregnant or lactating. Avoid large doses or prolonged use if you have high blood pressure. Korean ginseng can warm the body and is best taken in the colder months. American ginseng and Siberian ginseng are considered cooling, and are better suited for the warmer months. High doses of Korean ginseng can sometimes cause irritability and/or insomnia. 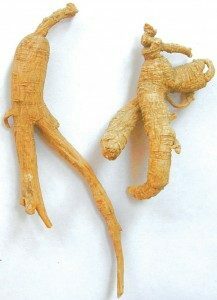 Panax ginseng was discovered and first used around five thousand years ago in the Manchuria, China mountains. First used as food, it soon was discovered that the people eating it were experiencing an increase in strength and a better resistance to stresses of all kinds. The root is a fleshy, multi branched and man-shaped. It has become a symbol of overall health to the Chinese people. According to Chinese legend, emperor Shen Nung discovered ginseng around 2700 BC. The Chinese considered him to be the father of herbal therapy. It was Shen Nung who said that the ginseng root can be used to calm the mind, bring the soul into harmony, eliminate fears and clarify thinking. Only the emperors could use ginseng at that time, as it was considered too special for the common man. It’s considered an “Ultimate Tonic”. It is probably the best known herb in the world. The extreme popularity of ginseng eventually lead to it’s over-harvesting to the point that wild ginseng at one time was more valuable per ounce than gold. The good news about the powerful herb soon spread throughout the world and ginseng was traded with other cultures. Korea started to harvest the root around the 1900’s and now supplies the herb to many people in the world today.